Is Wellness Your Number One Priority? From organic superfoods and cross-functional exercise routines to holistic treatments and herbal remedies; everyone is on the lookout for proven solutions that can help them along the path to better physical and emotional health. Unfortunately, in an industry teeming with short-lived fads and much hyped products that fail to deliver, it can be difficult to figure out what works and what doesn’t. Is Your Body Getting the Nutrition It Needs? Whether you’re working full time or recovering from the effects of a long layoff, your systems rely on critical nutrients to keep you going. Unfortunately, a variety of digestive issues can severely hamper your ability to absorb these nutrients through food and drink and oral supplements. From indigestion and bloating to inflammations which cause your body to flush out vital vitamins and minerals, there are a number of indications which can negate the effects of even the healthiest diet. 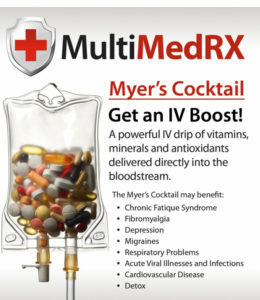 The Myer’s Cocktail is revolutionary intravenous (IV) treatment first pioneered by Dr. John Myers in the 1960’s. Initially, this powerful blend of vitamins and minerals was used to manage the symptoms of chronic conditions including fibromyalgia, asthma and cardiovascular disease. In each case, the injection produced marked improvements in the energy levels, mood and immune responses of patients. Today, Dr. Myer’s philosophies have been further developed to produce a unique healing solution that can be used to treat everything from minor ailments to more pervasive conditions. The current Myer’s formula is made of an optimized mixture of essential nutrients which includes magnesium, calcium, Vitamin C and B complex. Because these ingredients are administered through an intravenous injection, serum concentrations can be effectively increased far past the point of traditional oral supplements. When these nutrients are injected, they bypass regular digestive processes; instead, interacting directly with the bloodstream where they are activated in the blood cells. The result is an instant and perceptible boost in your body’s functionality and performance levels, which can last for months at a time. • We assess your current electrolyte levels to determine the best course of treatment. In each case the specific cocktail can be adjusted depending on your specific mineral and vitamin deficiencies. • A small catheter is inserted into the vein of your hand or forearm. • We insert the IV line and attach it to the Myer’s Cocktail formula. • The infusion is administered slowly over the course of 20-30 minutes to ensure maximum effectiveness. • It is common to feel a sensation of warmth or coldness spread through the body as magnesium enters the bloodstream. • Frequency of treatments can differ depending on your condition.  Cute conditions can be treated bi-weekly on an ongoing basis.  We can offer a series of treatments in the run up to an important athletic or professional event to keep up your energy levels and immunity, and boost your recovery times during the period.  Seasonal allergies, migraines and depression can be treated on a tailored basis.